In an essay of mine that went up today on the Los Angeles Review of Books, I mention a game I went to by myself in the summer of 1986. I wanted to see Tom Seaver pitch. He had recently been acquired by the Red Sox and wouldn’t be in the big leagues much longer. He faced Mark Langston that day. I was eighteen and starting to notice the blurring of the world and wanted the game to stand out from that. I wanted the game to be memorable. I didn’t want it to just come and go. The presence of Seaver in the middle of the diamond offered some hope that the game would amount to something, but that alone wasn’t enough. The game had to have a story. How often does life feel like a story unfolding? Maybe this is one reason why organized religion is such a draw: it’s a way to impose upon life the feeling of being part of an orderly, urgent narration and not just senselessly adrift. Anyway, the game answered my prayers, and for a few innings, for an hour or two of my life, I was inside a story. I don’t recall the latter part of the game beyond a sense of relief that Seaver’s efforts—he pitched well through seven innings before tiring—were not squandered by the Boston bullpen. 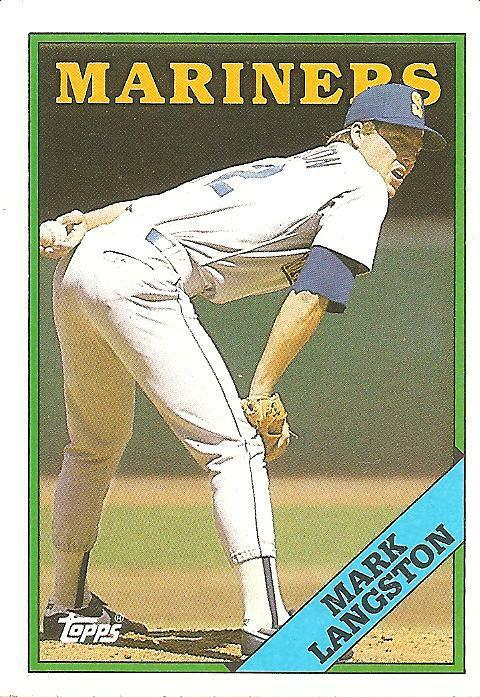 But I remember the building drama of the first six innings, when Tom Seaver and his opponent, 26-year-old lefthander Mark Langston, engaged in a duel. The box score the next day would obscure this element of the game. In the end, Mark Langston, undone by a little wildness, sloppy fielding, and some timely hitting by the Red Sox, somehow ended up surrendering seven runs before the game was over. But for six innings, he outpitched Seaver, retiring 13 batters in a row, five via strikeout, after spotting the Red Sox a run in the first. For a moment, long enough for the game to stay with me all these years later, he was every bit as effective and almost as mythic in his role as the young flamethrower as Seaver was in the role of cagey twilit legend. Earlier in his career, Seaver had racked up nine seasons in a row with over 200 strikeouts, a feat that among other things amounted to my favorite thing to stare at in awe on the back of a baseball card. By 1986, he hadn’t approached that mark in eight years, since 1978, when his opponent, Mark Langston, was still in high school. Langston, on the other hand, had led the league in strikeouts as a rookie in 1984 and would do so again in 1986 and 1987. The card at the top of this page, from 1988, captures all of those numbers, showing his league-leading strikeout totals in italics. Langston had only been in the majors for four seasons, so the italics dominate the card, painting Langston as a latter-day Herb Score. In a way, his 1988 card was something of a peak for him. Unlike the star-crossed Score, Langston would go on to have a long and successful career, winning 179 games and recording more strikeouts than all but 32 men in the history of the game, but he’d never quite become the legend he seemed within reach of being as a young lefty ace with an electric fastball and baseball card numbers screaming in italics. That’s one reason the game has stuck with me. Langston. He seemed for an hour or so of my life unhittable, a legend. It was all the great Seaver could do to just hang with him. Then, so quickly as to be unnoticeable, he lost it, just a little, and joined the human blur. I found your review/essay (more the latter?) much more engaging than the Harbach novel itself. It seems like a novel I would have written when I was 23 — forced literary references so that people would know that I had been an English major, transparently contrived plot, etc. (And, parenthetically, I mean no offense to 23-year olds.) The actual baseball stuff is ok but the characters just seem a little phony to me. There are lots of Owen Dunne types on college campuses, but they are not on baseball teams. This was the first major league game I ever attended, as an already Red Sox mad 9 year old. The family had been to McCoy stadium a dozen or so times, but this was our first trip to Fenway, and I recall my father being as excited to see Tom Seaver as I was. I’d like to brag that as my first every big league game, I remember everything, but the almost hundred subsequent visits have blurred the finer details. I’d only recalled that Seaver got the win, Armas and Sullivan (the backup catcher, yeah!) hit homeruns, and a good time was had by all. I’ve told the story of going to my first Fenway game plenty of times, and never in my mind have I ever thought about the Mariner’s performance that day. Nice post.